Tobins' Tastes: Happy 2nd Anniversary Say Not Sweet Anne- $300 Amazon Gift Card Giveaway! 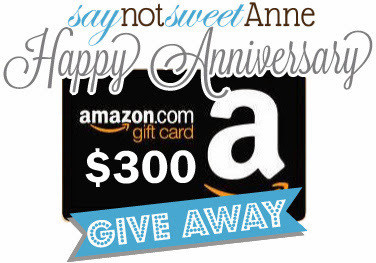 Happy 2nd Anniversary Say Not Sweet Anne- $300 Amazon Gift Card Giveaway! I have a fantastic giveaway for you today in celebration of Say Not Sweet Anne's 2nd Anniversary! I can't think of a better way to celebrate her two years of blogging than by giving away a $300 Amazon Gift Card. I can think of a million things I would use a gift card like this for. How about you? What would you buy if you won? Make sure to head on over to Say Not Sweet Anne and wish Kayla a happy second anniversary and while you're there be sure to check out all of the amazing projects and tutorials she has especially her HUGE printable planner. Use the Rafflecopter widget below to enter. Good luck!